- Major code change and optimization to fix compatibility with some scripted effects. - Added the command CUSTOMEXIT. - Fixed an issue where joining during a paused server with the script or adding the script while in a stage would spam the console with a warning. - Fixed an issue where the lights wouldn't follow the player appropriately after completing 1 or more levels. - Fixed lights disappearing permanently when a finished player dies. - Fixed certain sector effects like Zoom Tubes not working. - Fixed compatibility with Mystic Realm. Mystic Temple stages can now be accessed regardless of the activating player. - End Signs now spin properly when the first player finishes the level. - Slight code changes to make it more lightweight in netgames. - Fixed level finish messages being duplicated. - Added support to Utility's AFK function. Refer to the Known Issues for more information. - Added the command WARP, which lets you teleport to previous Star Posts once you have finished the level. - Tweaked REMAINING so it only shows players who can finish the level (non-game-overed or non-AFK ones). - Fixed goal icon offsets for Eggman (Eggpack) and Knuckles. - Added semi-invulnerability to finished players. They are now unable to lose rings or lives, and are impervious to drowning and suffocating in bodies of water and outerspace sections. - Fixed exit sector detection on FOFs (specially problematic in AGZ3 and PAZ). - Fixed goal icon offset for Metal Sonic. - Fixed an issue with the underwater timer. - Custom HUD removed. The script no longer conflicts with custom HUD modifications, non-green video modes or the centiseconds display. - Fixed players being permanently unable to move when finishing (hopefully, since I'm not entirely sure of what caused it). - Added "One" option to CUSTOMEXIT for problematic levels like AGZ3. - Finished players can no longer break monitors by default for balance reasons (togglable anyway). - Adjusted goal icon offset for Pointy Sonic so it doesn't cover his emoji. - Utility compatibility issues resolved. This is a very simple yet very requested feature in most Coop servers. 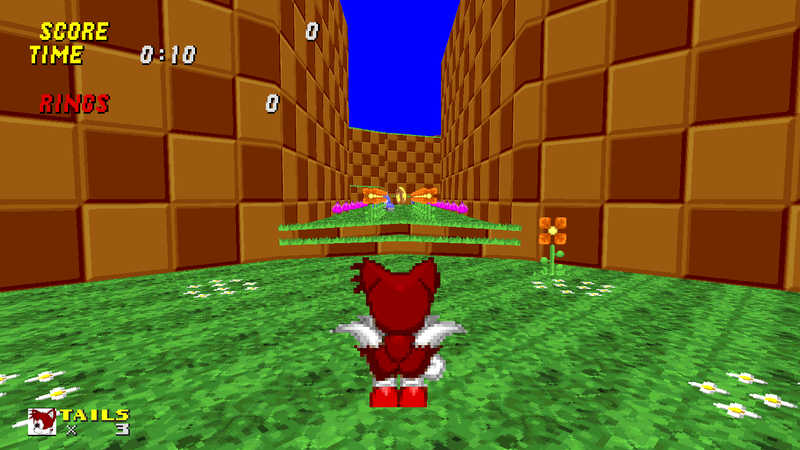 The script allows you to play normally around the map after you've finished the level and do whatever you could do while you haven't yet: collect rings, items and kill and be hurt by enemies. You can also warp between Star Posts so you don't get stuck at the end of levels that are a point of no return. REMAINING: Shows a list of players who haven't finished the level yet. CUSTOMEXIT <One / Half / 3/4 / All>: Sets how many players are needed to finish the level. WARP: Teleports the player to a previous Star Post in a cyclic fashion, given that the player has finished the level. MONITORPOP <Y / N>: Toggles whether finished players can destroy monitors or not for balance reasons. Turned off by default. - Custom exits may not work if one of the players doesn't finish the level alone, as in, with no other finished players standing in the exit sector. - Players who finish last might not be announced as so in the console. it's one of those things I never knew I wanted, but now that we have it I am very happy. This should be a staple on co-op servers. I'm terribly sorry for having to update the file so soon, but I've just fixed a problem with the goal lights. The script shouldn't have any glaring problems right now, but please tell me if you find something! I really hope no mods target me for this double post, but I have a slightly major update to announce. ExitMove now works with Mystic Realm! - Slight code changes to make the script more lightweight in netgames. Please report any new glitches or inconveniences! Last edited by Ikkarou Tatsuru; 07-07-2018 at 06:48 PM. Reason: Good bye, old version! New day, new update! This time, I'm bringing in a new command to enhance the script experience and adding the so-asked for compatibility with Utility. I appreciate any feedback, bug reports and ideas to improve the script. Enjoy! Bringing a small bugfix. While there are other glitches, they aren't very gameplay disrupting and since their nature is hardcoded they're not priority as of now. So this happened in a MP server when the host finished. The goal orb never appeared for the host and every other one stopped following us and stood still. No new ones ever appeared after that. A level reset resets that behaviour (works fine until the host finishes). Also, the (custom timer HUD?) has some issues with certain resolutions and permanently disables things like the centiseconds indication of the timerrres variable. EDIT: Also, no idea why, but the time loops back to 0:00 after every hour. Last edited by gregory_house; 07-26-2018 at 11:27 PM. Do you have access to the files the host used in that server? This isn't a glitch I've noticed in most file combinations so I imagine a different one might be triggering this behavior (the only instances where P_TeleportMove is called have only the light mobj as an argument, so it's a little strange that it got a number in the first place). Those issues are related. ExitMove uses a custom timer to properly stop HUD time for finished players and thus has to use different variables, since the variable that measures time is the same that lets players move around. About the 1 hour issue, that might be related to the function used to convert minutes into seconds, and although I think it should display everything properly, I'll take another look at the code again. I am going to try including a centisseconds display and accurate positioning for non-green resolutions, well... As soon as I figure out how. Do you have access to the files the host used in that server? Basically the files Spectrum uses every day in his server. That issue seemed to disappear the other days though. Due to requests, the custom HUD has been removed (with a much more effective solution, actually. I've got to apologize for not thinking of it before) so you don't get ugly time counting with your mods. Here it is! Sorry for the hiatus! I have been out of the community for a short while but still cracking my head about how to fix the last version's main glitch. Here's what got changed this time. Please report to me here on in either Discord community servers if any new issues appear. To be fair SRB2's exiting code is way too unbugding and this script is a mere hack that can only do so much. Listening to people's impressions on the previous version when I came back, they didn't seem to be bothered that much by the bugs (and even made their own fixes in the meantime that I was out!) and since investigating the causes of the new bugs might not be worth the effort for now because I'm out of ideas, I may just leave this script unsupported for a while. I'll make sure to keep both versions available.